The I Ching, translated as The Classic Book of Changes, is one of the oldest known Chinese texts of philosophy and divination. Along with the Tao Te Ching, the I Ching is the most well-known classical Chinese work of ageless wisdom. It is a complex body of knowledge at the foundation of Taoism. As such, the wisdom of the I Ching has influenced numerous ancient philosophies and disciplines, including feng shui. Even though widely known as a divination tool, the I Ching is definitely much more than that. Conveying the rhythms and laws of Universe in a specific structure of 64 hexagrams, this ancient text opens the door to a deep understanding of humans actions, desires and the inevitable nature of change. The author of the I Ching is considered to be Fu Hsi, who is somewhat of a mythical figure in Chinese history. It is purported that he lived in 2800 to 2737 BC; and that he discovered the eight trigrams of the feng shui bagua by reading the back of a mysterious turtle. The eight initial trigrams later developed into 64 hexagrams, which are sets of six lines expressing the yin and yang nature of any energy, be it an event, a person or an intended action. The Yang energy is represented by solid, unbroken lines and the Yin is shown in lines with an opening in the middle. It is said that in ancient China yarrow stalks were used to ask the I Ching for guidance, while today Chinese coins serve the same purpose. Various questions can be asked—from the best timing for a journey to the possible outcome of a business venture. Apart from the divination aspect, the wisdom of I Ching can take a lifetime to access and understand. The complex cosmology of this ancient text can be full of paradox, and the seemingly endless interpretations and levels of meaning for each of the 64 hexagrams require a strong, inquisitive and open mind. How Is It Connected to Feng Shui? In feng shui, each bagua area has a specific trigram associated with it. By understanding the energy and the meaning of a bagua trigram, a feng shui practitioner can access the essence needed in a specific place at a specific time. 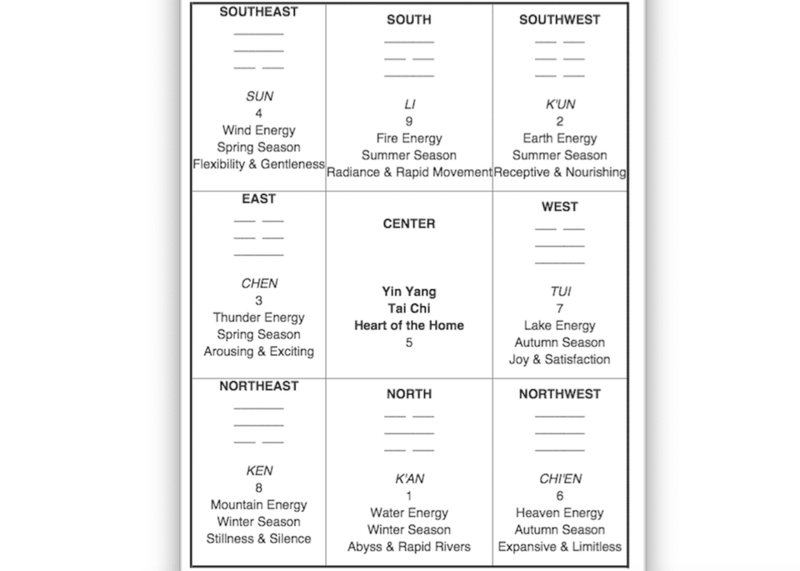 The feng shui bagua and the feng shui compass are both mystical tools that use the I Ching knowledge. Let yourself explore them at a slow, comfortable pace. Allow them to reveal themselves to you slowly, as they contain the wisdom of many thousands of years.